At 4.00pm last Thursday, fourteen hearty souls braved Melbourne’s insouciant rain and made their way to Heidelberg’s Warringal Cemetery. We gathered to celebrate and commemorate the restoration of Thomas Wentworth Wills’ gravestone. The first person there was John Holmes, trophy-maker extraordinaire who also has the unenviable task of cleaning the mud, blood, beer and champagne off the Sheffield Shield every year. Soon after we were joined by historian and Collingwood fan Robin Grow, who has written extensively about the boom years of VFL footy either side of the 19th and 20th centuries. Gigs shuffles along and tells us that we couldn’t have picked a better day to meet at a grave yard. At this stage the rain is coming in sideways from the South-West, rendering much of our umbrellas useless. John Harms, Marius Cuming, Greg de Moore and a handful of donors who I’m yet to meet gather around Tom Wills’ grave and we pay our respects. The etchings are clean and clear, the stone has been been polished and the cast iron railing was put in place the day before. The site looks much more befitting of Australia’s most important sporing figure. I feel proud and honoured to have been part of making it right. In the driving rain we adjourn to the North Fitzroy Arms for a celebratory dinner to thank the donors and contributors that made the Tom Wills Grave Restoration project possible. Tonight, my mum Mahi is my guest. She donated after I told her part of the Tom Wills’ story. Whenever we visit my dad’s grave in Warringal we walk over to Tom’s grave and pay our respects. Mahi gave for “the good of his soul” and her son’s. She knows that Tom Wills somehow reached out and helped me see the error of my alcoholic ways. Mahi has endured the mood swings, verbal abuse, hospital visits, recriminations, finger-pointing, blaming, irrational fears and finally the recovery and restoration of her youngest son’s life. Born a few weeks after the Collingwood Machine’s 1930 triumph which culminated in the still yet to be equaled 4-in-a-row, Mahi was born in Tsamantas, a village close to the Albanian border in North-Western Greece. Her father left my grandmother pregnant with Mahi and came to Australia in June 1930. Mum would meet her father for the first time in 1953 when she finally got to Melbourne at the age of 23. Her first memories were of The Depression, Italian occupation, German occupation and a brutal civil war, which not only divided her village, but her family as well. Collingwood became mum’s new village, a place of hope and new beginnings and it also became mine, hence my passion and fanaticism for the place and the club. She had a wonderful time, talking with Richard and Dot and enjoying the fine feat feast put on by the crew at the NFA. She enjoyed the energy and the camaraderie in the room. Of John Theodore Harms she says: “He is beautiful boy”. What can you say about Harmsy? Aside from being a brilliant writer and story-teller, JTH is a man of the people. I get the impression that he loves connecting others and seeing friendships and alliances form, almost as much as he enjoys writing. The thing that first struck me about JTH is that he is a keen listener who is genuinely interested to hear your story. Some pretend to listen or only hear part of the story, but Harmsy gives you his full attention and the depth of his engagement informs his writing and his conversations. A true empath, if he was a footballer, I reckon he would be like Boris Enright, always looking to bring others into the game and set up play so the players up ahead can make the most of the possibilities he creates. Isn’t that a huge part of what The Footy Almanac is about? Thanks for seeing the potential in this project, JTH and for your wonderful support. Marius Cuming masterminded the project after our first meeting back in September last year. He got permission from the Wills family to proceed, organised media, crowd funding, put together a wonderful YouTube clip to promote the cause and most importantly, liaised with Melbourne Memorials to ensure that the grave was restored on time. His tireless correspondence and support was pivotal in getting the idea off the ground and turning it into reality. A Bomber fan, Marius took the ball from Boris and like Michael Long in 1993, ran with it and got the project over the line with a day to spare. We can’t thank you enough for your enthusiasm, professionalism and dedication, Marius. Kudos. Sam Almaliki, Community Engagement Manager with Cricket Australia, spoke passionately about CA’s initiative to commemorate the 150 anniversary of the indigenous team Tom put together to play the MCC on Boxing Day, 1866. Sam recognizes that cricket at the highest levels is still a predominantly Anglo-Australian pursuit and one of his roles is to foster engagement with indigenous and multicultural communities so that the game can have a more diverse representation, similar to footy, rugby league and soccer. He mentioned the possibility of a documentary being made about Wills and the 1866 team. We hope that Sam and CA succeed in producing a film worthy of Tom’s vision and that the faces and names of Australian cricket will one day reflect the diverse cultural tapestry of the nation in the 21st century. Grand nephew, Terry Wills-Cooke spoke about Tom’s mother Elizabeth, was a very religious woman who did not want anybody associated with her son because of the way he died. Suicide being a mortal sin, the family respected her wishes until the MCC erected the first stone 100 tears after Tom’s death. A feisty and articulate speaker, Terry spoke of how many sportsmen struggle once the curtain closes and the adulation stops, inferring that Tom may have been unable to see himself as anything else, but a sportsman and thus suffered from the first death, that of identity. Terry was loath to portray Tom hagiographically and scoffed at any ideas about Marngrook having a direct link to Aussie Rules. Terry was grateful to us for restoring the grave and we are grateful to him for giving the project his blessing. Percy Jones is sitting at a table on his own, on the fringes of proceedings, listening to the speakers, like a big old cat with one eye open. I introduce myself and we start chatting about 1970 and 1979. His eyes become wide and alert when he recalls the memory of playing before a record crowd in 1970. “The noise was just unbelievable” he said, as for a moment it reminded him of how seminal that game was in Australian sporting history and folklore. I ask him about the rivalry and whether it was as fair dinkum between the players as it was between fans. “God, yes” he offered. 1979? “Mud and rain”. The memory didn’t seem to stir him as much as 1970. Why did Carlton win those flags over Collingwood? “Luck and the bounce of the ball” he said matter-of-factly. He meant it, too. He played, he would know. Greg de Moore is one of the most inspired, articulate and profoundly engaging after dinner speakers I’ve had the pleasure of listening to. He gave us a history lesson with the alacrity, passion and verve of a statesman. “A shrink by trade” and author of Tom Wills: First Wild Man of Australian Sport, Greg took us on journey that began with Tom Wills’ early years playing with indigenous children; his journey to Rugby School at the age of 14 “where he learned to drink beer because the water was too polluted”; his return to Melbourne and his rise as the nation’s greatest footballer and cricketer; the most important figure in the formation of our indigenous game; the tragic consequences of the Cullin-la-Ringo massacre, which may have resulted in Tom suffering from PTSD, hastened his descent into alcoholism and influenced his attempt to find peace by putting together the 1866 indigenous team. Wearing a GWS Letterman jacket with pride, Greg argued that the game of Australian Rules had come home because Tom Wills was born on the Molonglo Plain in the ACT. With the formation of GWS, now training at the Tom Wills Oval in Sydney, it is not hard to see beyond the rhetoric of the AFL after listening to Greg argue the case for the historical importance of a team in the region. 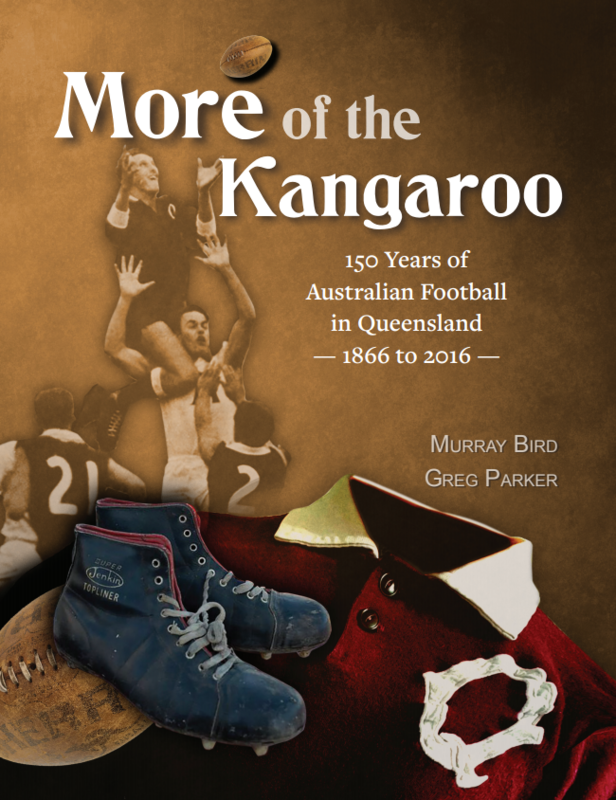 Thank you so much for supporting the initiative Greg and for your ground-breaking research which helps to reveal the complexity of Tom Wills the man and Australia’s first sporting legend. In conclusion, I ‘d like to sincerely than all the donors and supporters of the Tom Wills Project. John Holmes suggested that we meet once a year as collective under the banner of the Tom Wills Society. I think it is a great idea and would love to play a part in perpetuating Tom’s memory in this manner. Perhaps we can begin with a portrait of Tom Wills on the cover of the 2016 Footy Almanac? I would like to be part of this, but Thursdays are not free! Great work Phil on setting the ball rolling through your passionate writing and to all those who supported the restoration. Well done Phil. I would gladly be part of a Tom Wills Society. It was a privilege to be able to contribute to this most worthy endeavour. And great to meet you too. Well done, Phil, and thanks. I am honoured and fortunate to have been able to donate to the project, and disappointed that I was unable to attend. Tom Wills Society? I like the sound of that. Perhaps with Martin Flanagan as patron? Bewdy Phil. Give your mum a hug from me. Great stuff Phil – enjoyed reading about this journey. A very evocative account of the project, and dinner that followed. Well done to all involved. The formation of a Tom Wills Society is long overdue, and I (and I suspect, many others) would like to join. Isn’t it time the Premiership Cup carried the name of the game’s founder? Well said Phil. Well played all. In my mind the memorial will always be “for the fallen” as much as “for a sporting hero”. There is a light that never goes out? Greg de Moore’s book is a ripper. So many biographies are full of interminable detail interesting only to the obsessives. Greg is a gifted storyteller on the page as in person. The larger story and the feel of the times. Superb summary of a most memorable evening. Melbourne’ history is terribly interesting, particularly in light of how young we are as a city, and so too the grip ‘footy’ has on our people. Greg’s book really captured my imagination when I read it eight or nine years ago as I was finally able to gain an understanding of how the game came into being. Well done to all who had the drive to see the project to fruition. I must also give a special thank you to Lindy Burns from ABC radio for having me on her show to promote the cause. Danny Lannen from the Geelong Advertiser who wrote two wonderfully insightful articles about the project and Gareth Andrews, Geelong legend and enthusiastic Almanacker who kindly donated the limited edition book: ‘Wills Way’ which was auctioned to assist in the restoration. Cat from Country – I’m sure we’ll be able to find a day that suits. Cheers JD and thanks for all your support on the tweet in helping to get the message out. Keiran – It was great meeting a true blood and I look forward to chatting to you again soon. Smokie – Would be great if Martin wanted to be part of TWS. We’d certainly welcome his participation. Swish – I’m giving mum more hugs than ever recently. Her time is limited. Determined to make up for the past and make the best of what time is left. Cheers Mike, appreciate your support. Torp – love your suggestions. The period before Federation and the implementation of the pernicious White Australia Policy would be fascination to learn more about. Neil – lovely to meet you. The AFL didn’t contribute a cent to this project so not sure they’d name the Cup after Tom. Worthwhile suggestion. Maybe the Tom Wills Society could be a forum to lobby for that. PB, thank you and AE for your support. I agree about “for the fallen”. The Tom Wills story is also a cautionary tale as we addicts know only too well. Greg was a delight to listen to. Will be revisiting his book in greater depth as of this week. Congratulations to Marius Cuming, Phil Dimitriadis and John Harms for hosting the Inaugural (unofficial) Tom Wills Society Dinner and to guest speakers, Dr Greg De Moore, Terry Wills Cooke and Sam Almaliki of CA who spoke of the life and times of Tom Wills, a Founding Father, rules co-writer, player, umpire and administrator of our great game of Australian Football. 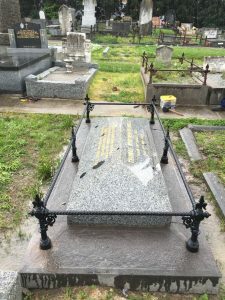 Also congratulations to those of us who earlier in the day stood by Tom’s restored grave at Heidelberg’s Warringal Cemetery in torrential rain and bitterly cold wind to honour Tom’s memory, his deeds and troubled life and his outstanding contribution to the game of Australian Football.. I have respectfully suggested the establishment of a Tom Wills Society with an annual dinner, Tom Wills Oration and a Tom Wills Perpetual Trophy to be awarded annually for someone voted by the TWS Committee (yet to be formed) for their outstanding contribution to the advancement of the game of Australian Football. I believe these proposals will be channelled through John Harms and his professional and committed colleagues at The Footy Almanac. 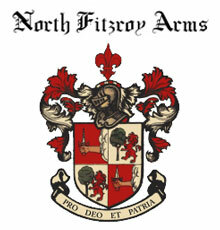 The dinner was held at the North Fitzroy Arms Hotel with mine host, the legendary Percy Jones in attendance. May the memory and deeds of Thomas Wentworth Wills long be perpetuated and Tom, may you Rest in Peace mate, you will never be forgotten! Warm congratulations for your role in instigating this worthy project but also for this moving article. I loved that your Mum is getting to enjoy your achievement, and it’s great that she is able to share your justified pride in what you have accomplished with the grave restoration. Obviously you didn’t do it on your own, but I don’t think it’s an exaggeration to say that without your initiative, it wouldn’t have happened. Hi Phil, It was a privilege to be at the graveside and the dinner. A wonderful day and night. Congratulations to you, Marius and all concerned with the restoration. At the cemetery I learned that I shared Tom Wills’ birthday – only a century and a bit apart. I felt humble to have some sort of link with the great man. Phil, congratulations on the Tom Wills Restoration project. 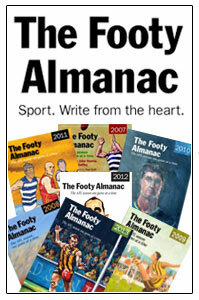 There was a time, a few years back, when I sensed you’d lost your way – in terms of the Footy Almanac, I mean. A bit burnt out, perhaps. Had had enough of footy. It appears you have found your way back, and in no uncertain terms. As Peter Fuller commented, it’s no exaggeration to say the restoration wouldn’t have happened without you. Kate – Great to meet you in person. 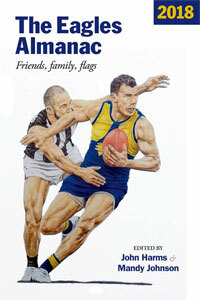 Your wonderful art has been a welcome addition to the Footy Almanac pages. More please !! John H – As soon as you suggested a Tom Wills Society I thought it was a terrific idea. I put my hand up to help organise, advocate and be part of a committee to promote the event. I see cricket being key here as well as footy. The more I read and learn about Tom Wills, the more I’m intrigued by his contribution to cricket, especially regarding the Indigenous team of 1866. Kudos to you for a great idea. Peter F – Thank you for your kind thoughts and for the chats we’ve been able to have about footy and life at Melissa. 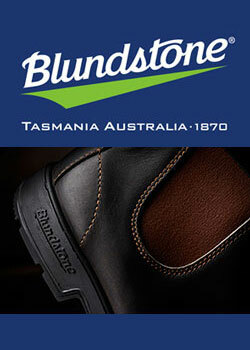 You’re alright for a Bluebagger. Mum is pretty good for an 86 year old. Sharp as a tack in the mind, even though her body is giving way to the wears of time. I hope we still have a few years left. Burkie – It was great to see you at the site, braving the elements. A true believer ! And thank you kindly for your support of the project and all things Almanac. Cheers. Thanks Rick/Slim – I think that there is still so much to learn about the legacy Tom Wills has left behind, through not only his sporting achievements, but the person he became, the consequences of alcoholism, mental deterioration and the loss of identity once cheers and backslapping cease. A timeless tale in so many ways. Vin – In 2014 I had indeed lost my way in many respects. My loss of interest and general joylessness were the signs of severe depression. Writing ‘Soma Mou’ http://www.stereostories.com/soma-mou-my-body-of-clay-by-notis-sfankiankakis/ for Stereo Stories was in some ways the first step in fighting back to understand and face my demons. For that, I’ll always be grateful to you. As for my role in the project: I was just the messenger. Without Harmsy and Marius and the generosity of the donors, the grave would still be in a state of decay. Well played Phil. Wonderful work. I too look forward to learning more about Wills’ cricket contribution. People like Tom Wills deserve to be remembered, talked about, acknowledged. BTW love having your words back regularly on the Almanac. Go Pies. I knew Wills played cricket for Collingwood, but yesterday, through reading Greg De Moore’s book I found out he captained them in some games as well. Tom Wills – A Collingwood Captain – Respect.